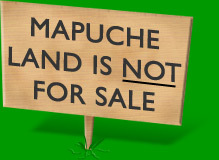 Mapuches excluded from the ‘United Colours’. Brief history of the Mapuche’s Territorial Conflict with the Benetton Group. Benetton has failed to respect the legal requirements regarding the operation of European companies investing in developing countries which are contained in the Codes of Conduct of the European Union (Resolution 15/11/99). Lawyers defending the Mapuche have found legal documents which corroborate the Mapuche’s persistent protests about the arbitary and illegal occupation of their territory by landowners, anonymous societies and the Argentinian state. “ Benetton change their stance as a chameleon changes its colour. On the one hand they promote the notion of a world of multicultural and ethnic harmony as reflected in their ‘United Color’ slogan, presenting themselves as benefactors of the poor. In reality however, they let no obstacle stand in their way in order to get what they want. They are happy to take away the basic means of subsistence from members of indigenous communities – the most vulnerable and discriminated against people in the world”. Donation by Benetton in favour of the native communities of Patagonia. 7,500 hectares of land in the Argentine province of Chubut - Ponzano, 3nd November 2005. Interview with Atilio Curinanco. By Pauline Bartolone - Esquel, Chubut, November, 2003. Mapuche International Link. Copyright © 2004.